GRF’s smallVOICE podcast is hosting an event at this year’s Aye Write! which is Glasgow’s popular and well-established book festival. 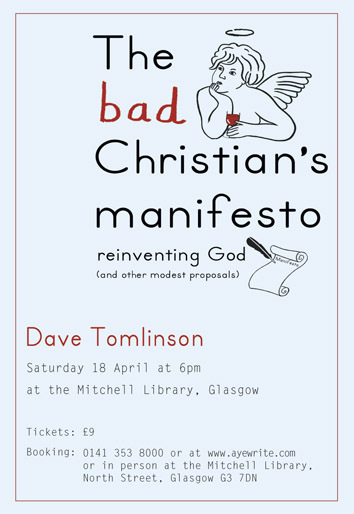 At 6pm on Saturday 18 April we are delighted to welcome Rev Dave Tomlinson. Dave Tomlinson was vilified in the tabloid press as ‘the villains’ vicar’ after taking the funerals of two Great Train Robbers, including Ronnie Biggs’ in 2014. For ten years, Dave led a church gathering in a pub in Clapham; he is a rubbish birdwatcher, a Liverpool supporter and he is convinced that God shouldn’t be left in the hands of the religious. smallVOICE brings Dave to Aye Write for an honest, maybe controversial, but always eminently reasonable session about finding God. The session will be chaired by smallVOICE presenter Darrem McKinnon, and other members of the GRF Team will be at the event. Do come along, enjoy the session, and say hello! Tickets are £9 and you can book online at www.ayewrite.com or by telephone 0141 353 8000 or in person at The Mitchell Library. Check out the smallVOICE website at www.smallvoice.org.uk for updates and news.